Auckland Transport launched a tag-on tag-off public transport pass this week targeted at tourists visiting Auckland during Rugby World Cup 2011. 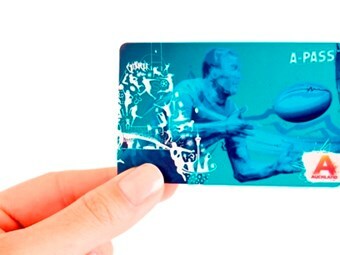 Specifically developed for tourists and visitors to Auckland during the RWC 2011 period, the A-Pass is a ‘limited time’ public transport pass. The A-PASS will provide all day travel across the Auckland Transport network, encompassing train, bus and ferry. The pass will be available for sale in the lead up to and during the RWC 2011 between September 1 and October 24. Auckland Transport Chief Executive David Warburton says the card is part of a suite of smart ticketing cards within the Integrated Fares System project being phased in across the region. "The A-Pass marks the first introduction of Auckland Transport’s Ticketing partner, Thales, and Thales technology, into the city’s smartcard mix," Warburton says. Auckland Mayor Len Brown says the A-Pass is another step towards full integrated ticketing. "International visitors expect this kind of approach to public transport," Brown says. "I’m looking forward to the day that it will be part of everyday travel for Aucklanders." Thales New Zealand Chief Executive Officer Peter Beggs says the A-Pass has always been part of the rollout schedule for the AIFS project. "Using the A-PASS during RWC 2011 provides an excellent opportunity to have an early demonstration of some of the key functionality of the Thales system, prior to the full rollout from mid-2012," Beggs says. When the full system is rolled out it will be electronic, hold stored value and passes, be used as a tag-on tag off smart-card for all participating public transport operators, include online top-up and incorporate a range of concessions and discounts. During RWC 2011, the A-Pass includes discount offers to attractions around the city such as Auckland Zoo, the Stardome, the Voyager New Zealand Maritime Museum, Auckland Art Gallery, the Edge, Museum of Transport and Technology (MOTAT) and Auckland Museum.